Hi, if you are interested in taking a look at this or distributing around. Basically a show I have generated of Artworks/ Sculpture generated from found recycled materials. An LP record stand to show off the cover art, protect it from the daily hazards and always know where you left it! This single hardwood plank (species unknown) was surprisingly dense and though looked to have been in the sea for a year was still fairly sound over all. For some reason one face had eroded in a more furrowed way than the other. I kept the smoother bleached out side exactly as found (became rear face of stand) and worked the furrowed face. -I crafted a joining biscuit from a bit of scrap 3 ply and routed a groove to fix the two face sections and then screwed the leg supports to flatten and secure the face. -Drill and place brass rod supports (found a length of this in the street). -Add SALTANDWOOD stamp and varnish select surfaces to generate contrast to preserve as found faces. This is the end scrap of a laminated timber post that I pulled out of a skip bin. It already embodied loads of character with pre pencil rounded edges, laminated striping and zig zag joins. I applied some simple cross cut ideas to yet another CD stand. Utilising no other elements but the post itself to generate the functioning sculptural body. The rest was finishing the timber to bring out the colour and texture. It has an ink stamp on the side and a pressure stamp added to the base. The separate bits were glued and then I dropped a few long countersunk screws up through the base to ensure a 1000 year shelf life. I know I know who listens to CDs anymore? Well me and besides they are the new retro item after LPs! And making these stands is strangely addictive. In this case the third element of the resting pins has been deleted by arranging the legs such that they also do the job of supporting the CD for display of cover art and always knowing where the cover is. 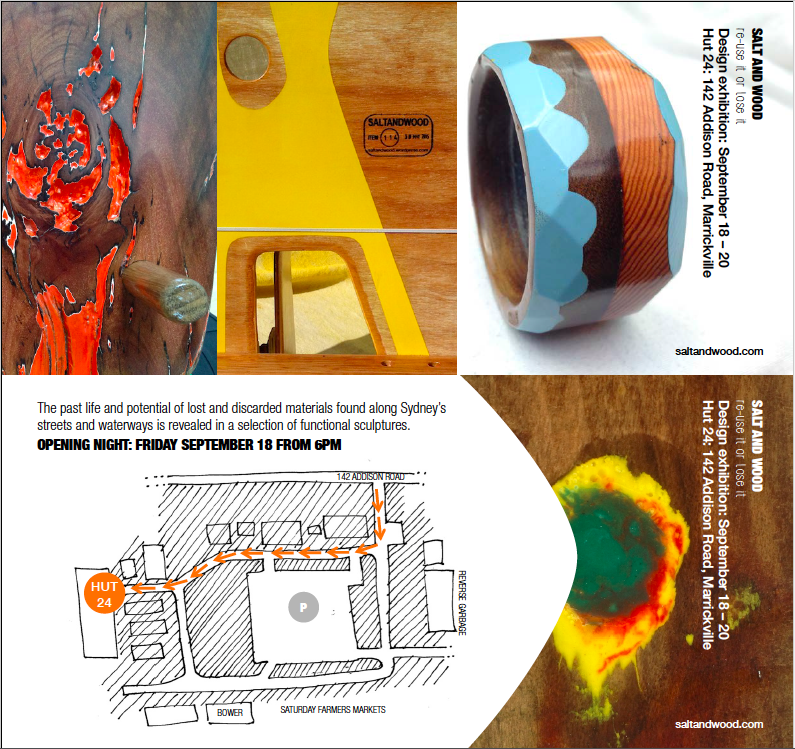 ITEM 72 is formed from a chunk of hardwood found washed up on the beach and a piece of ply that looked like it came off a yacht judging from the type of varnish it retained. I sanded and varnished one face of the block retaining the other 5 surfaces as found and cut slots for the legs I cut out of the ply scrap. And voila, ITEM 72. So no ITEM produced here, just sharing some of the SALT AND WOOD experience! In this case a kind of ‘day in the life’ picture summary of the strange and interesting things one encounters when hunting about for materials for a next project. “There is a pleasure in the pathless woods, There is a rapture on the lonely shore, There is society, where none intrudes, By the deep sea, and music in its roar: I love not man less, but nature more”. Rochdale ^18 Childe Harold’s Pilgrimage, canto 4, stanza178. Compiled from street found lamp fittings, a retro Australian made (*439 DÉCOR Australia) orange plastic flowerpot and flotsam washed up around Sydney Harbour. The blue parts look like they might have been some sort of packing palette, the legs and edge trim look like they are probably fittings broken from a yacht. The rudder (I couldn’t resist) was cut from a ply panel again most likely off a yacht or cruiser. Angled legs and curved corners and it all culminated in this fun little sculpture/ complimentary colour lamp/ phone and wallet spot! This very dense block of hardwood (maybe Eucalyptus?) was discovered hiding deep inside the rocks of a wave break wall. After a month or so of drying in the sun I cut away the top surface and one end to reveal the grain. The whole unit was split long ways from the base so a series of timber pegs were employed to cross dowel the block. To enhance the sense of the maritime, a simple long slot was cut along the front and back face. Something like the Plimsoll Line of a ships hull (http://99percentinvisible.org/episode/episode-33-a-cheer-for-samuel-plimsoll/). The area below the line sanded and painted. The areas above the line left as the day they were found. A router was used to cut simple slots in the base into which rail legs were fitted. The legs were restored from timber salvaged from discarded garden furniture. The lampshade was found on the streets of Newtown and a shower rod end was used to mount it in the deck. The red cord was purchased in Copenhagen a year ago and the plug end is new. Add some light fittings (street recovered) and voila the Cargo Lamp.